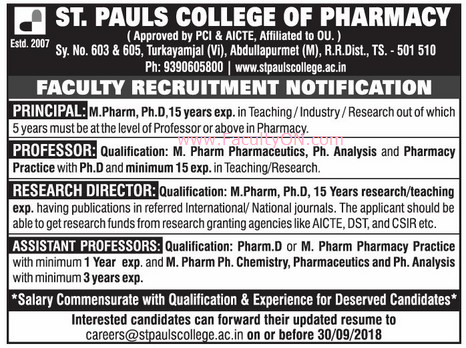 St.Pauls College of Pharmacy, Ranga Reddy has advertised in the EENADU newspaper for the recruitment of Professor / Assistant Professor / Principal / Research Director jobs vacancies. Interested and eligible job aspirants are requested to apply on or before 30th September 2018. Check out further more details below. About College: St. Pauls College of Pharmacy was established in 2007, approved by All India Council for Technical Education (AICTE), Pharmacy Council of India (PCI), New Delhi and affiliated to Osmania University, Hyderabad. The college is situated in a serene and beautiful campus which is conducive for imparting quality education, helpful for the growth of knowledge and career building.